This stunning Lucite mandap was created by the talented Shawna Yamamoto for an Indian wedding between Cinal Bhindi and Taju Patel. The wedding day, which took place at the Long Beach Hyatt, had 500 guests while the reception, which took place the next day at the Anaheim Marriott, had 900 guests. 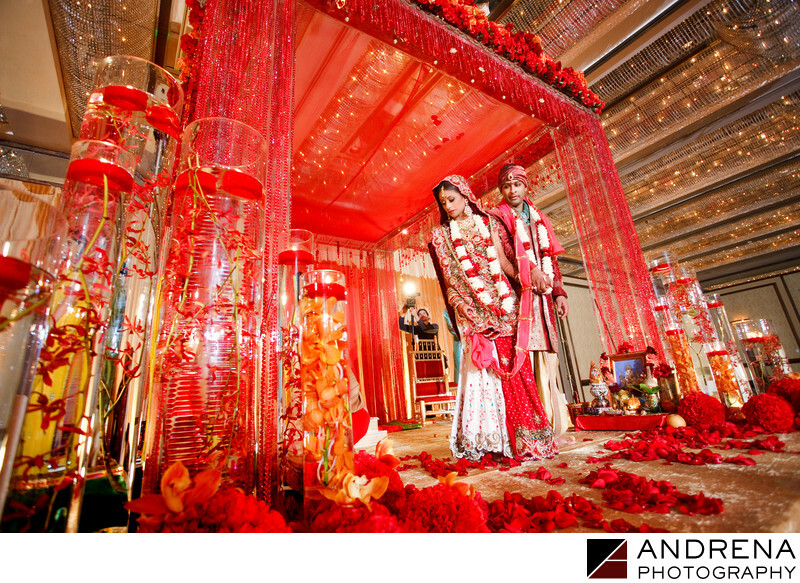 Shawna handled all the decor and florals with her typical creativity and imaginative ideas, and the wedding was published in South Asian Bride magazine. I loved the use of red and yellow flowers, as the really made the ballroom come alive. The ceremony itself started at 8 a.m., which is one reason the couple chose to have their wedding ceremony inside. The couple drove away from their wedding day in a gorgeous white Bentley. Indian wedding photographed at the Long Beach Hyatt in Long Beach, California.